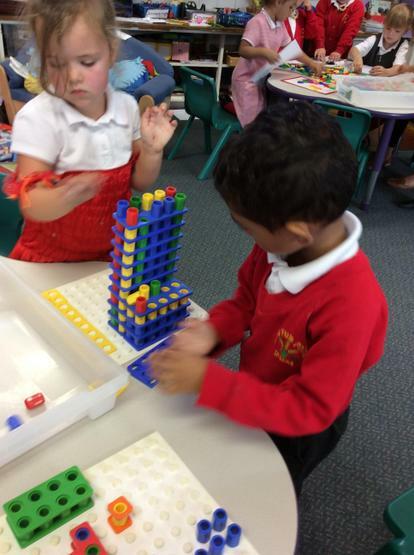 Welcome to Woodpecker's class page! 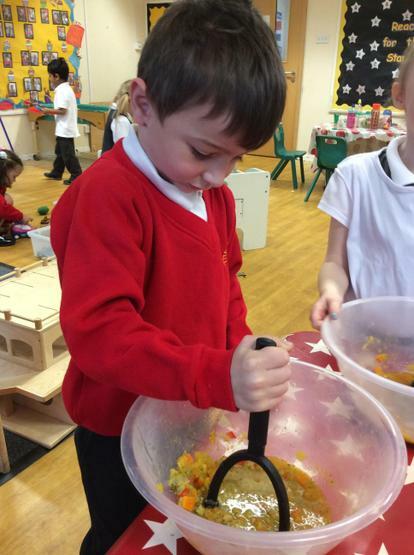 Please check back regularly to see all our exciting learning journey! 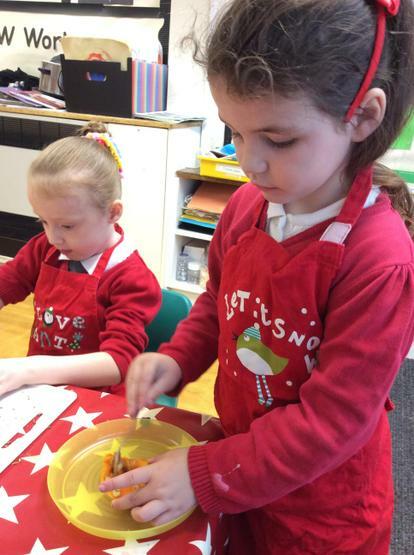 Our class teacher is Miss Brassinne and our Learning Support Assistant is Mrs Homer. 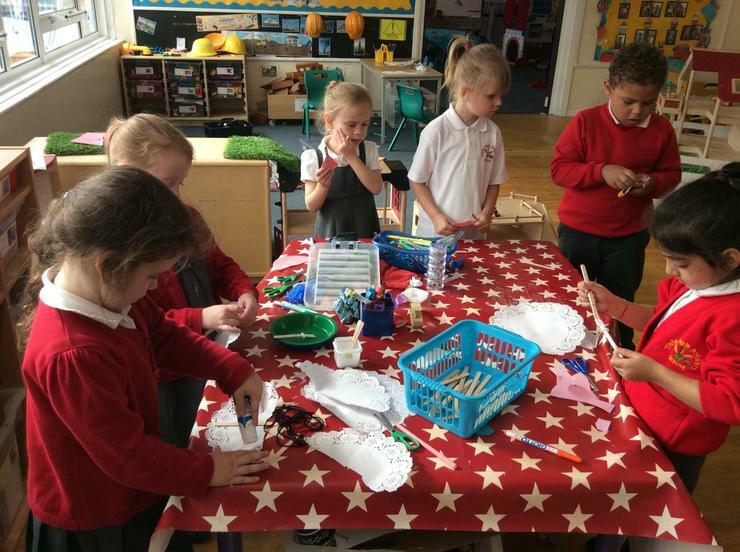 Mrs Reynolds teaches the class on Wednesdays. 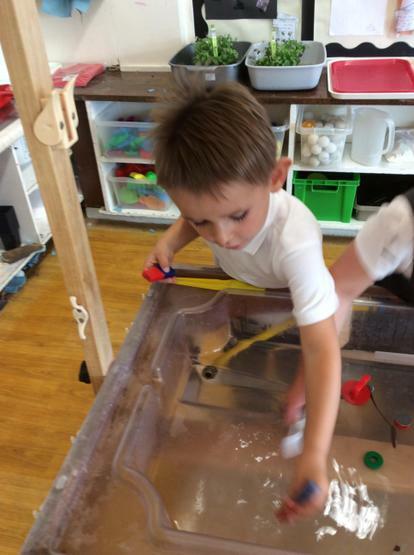 PE is on a Monday morning so your child will need PE kit (black shorts, red t-shirt and suitable footwear). 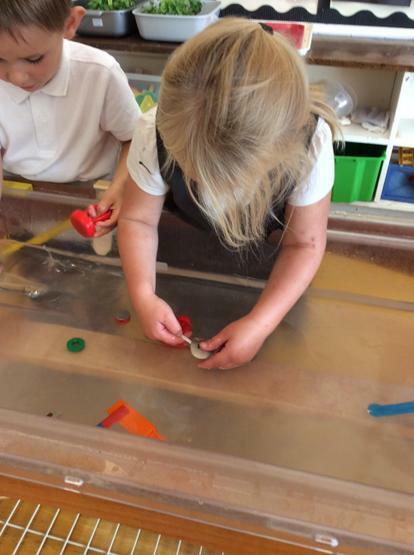 This term we are going to be practicing getting ready for PE by ourselves, learning the rules that we follow to stay safe and playing lots of fun games. 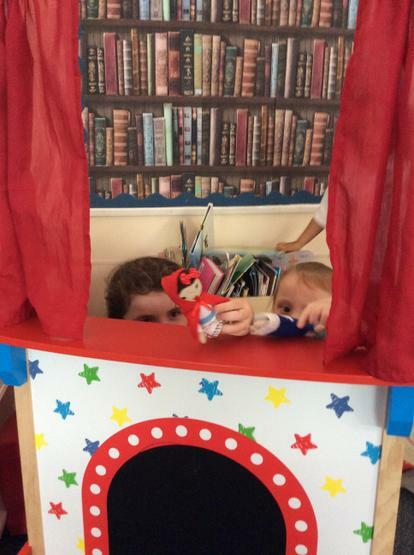 Reading books are sent home each day, please spend time sharing the book with your child as it helps them improve their confidence and reading. 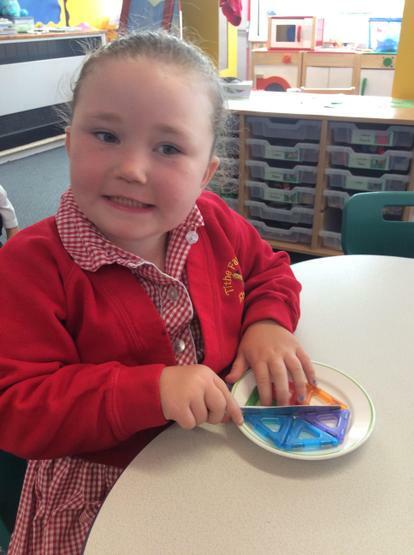 Phonemes - each week we will be sending home the new phonemes the children have learnt in a wallet. 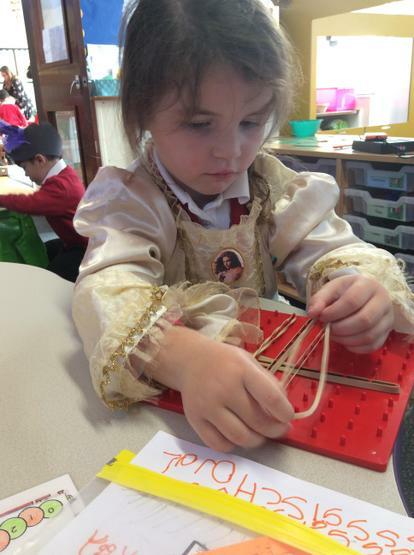 Please sending some time going through these with your children, it really does help them with their reading and writing. 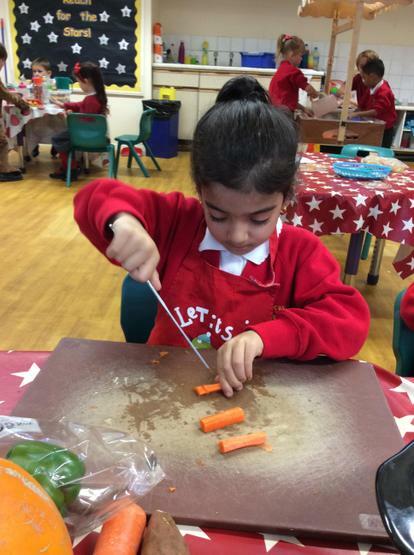 This year we are starting 'In the moment' with the children. 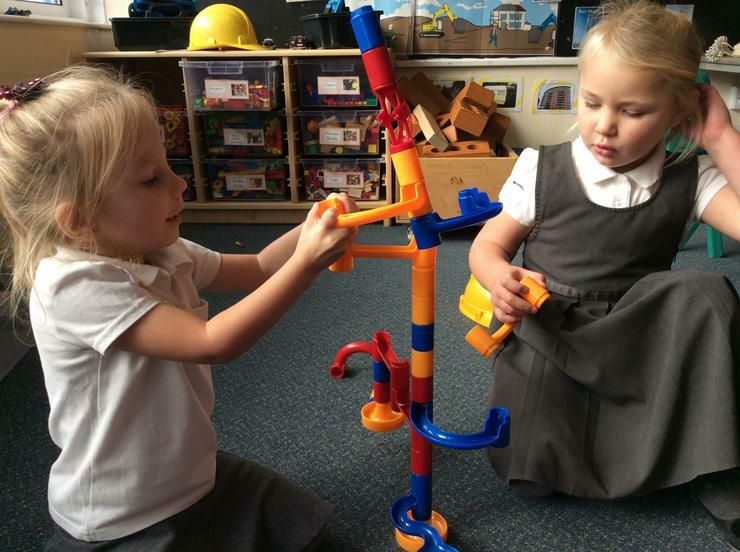 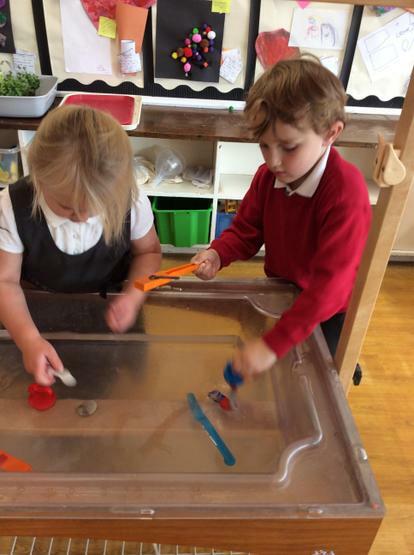 This means that we follow the children's interests and moving their learning forwards during their play. 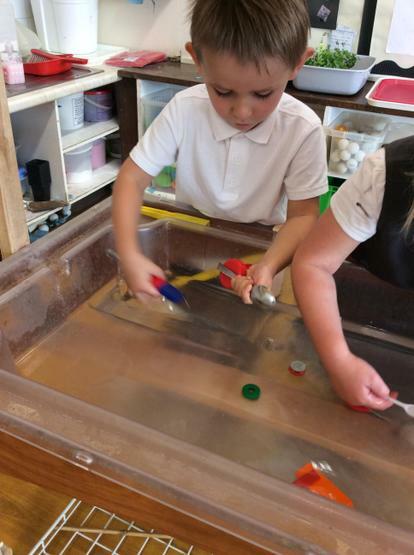 Each week we will be focusing on 3 children, closely watching them at play and working with them to focus their learning and work on their next steps. 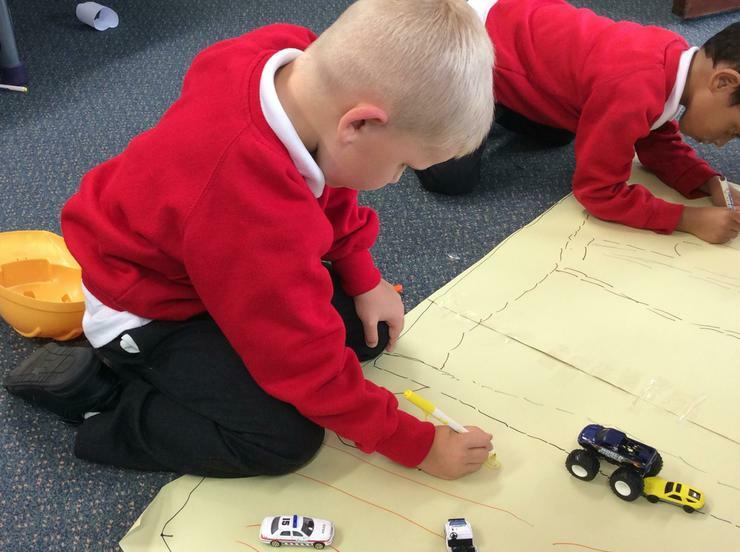 Our observations will be presented in their learning journeys and photos from home will be included. 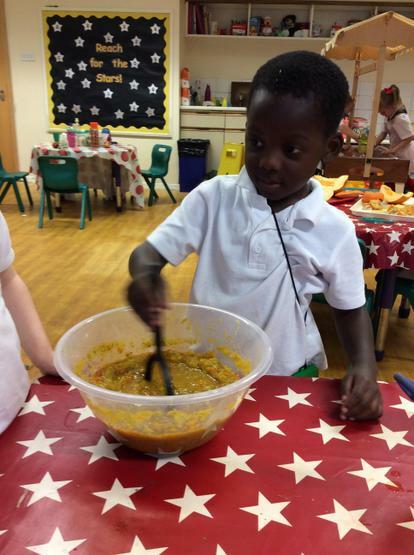 When it is your child's focus week and letter will be sent home so you are aware. 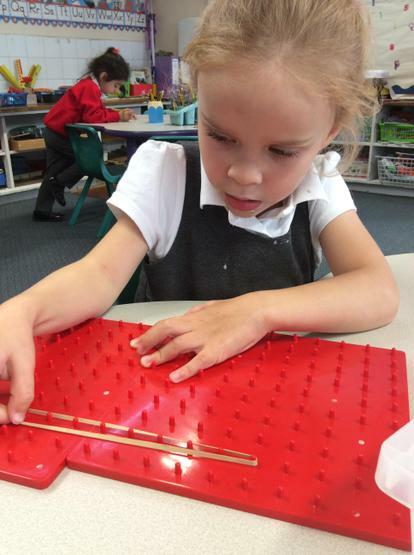 Phonics and Maths will still be taught in separate sessions as well as being moved on in their play. 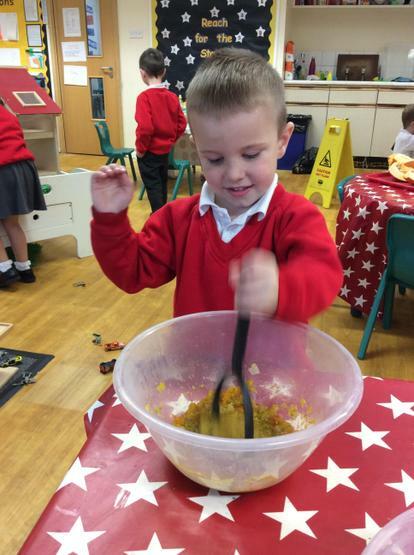 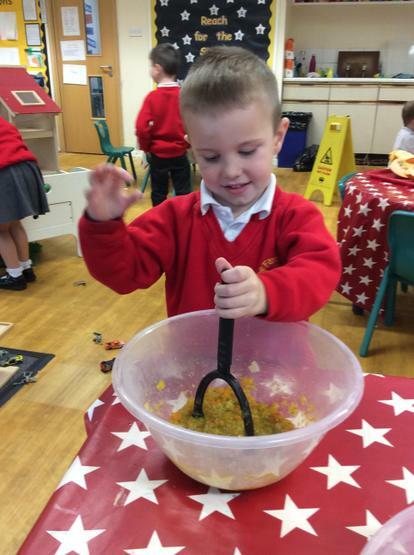 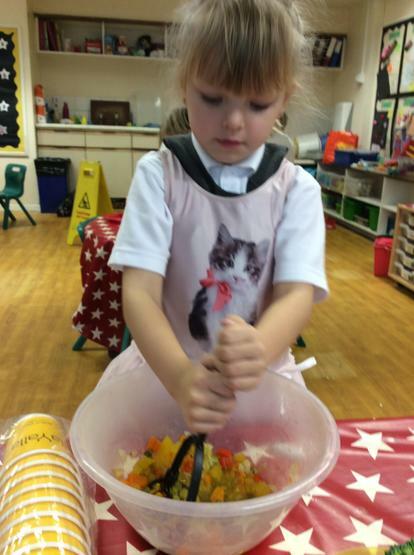 We have been reading the story 'Pumpkin Soup'. 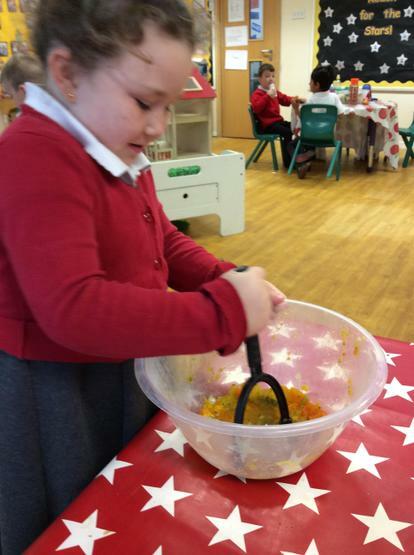 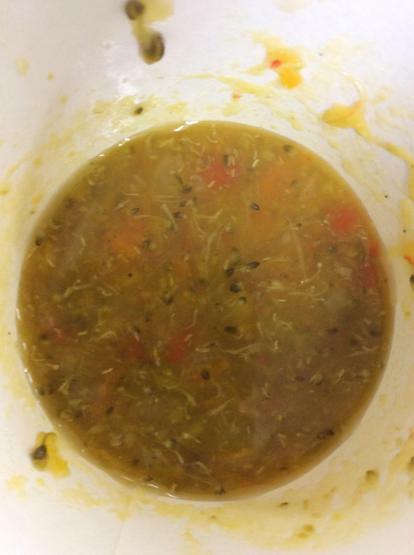 we decided to make our own pumpkin soup. 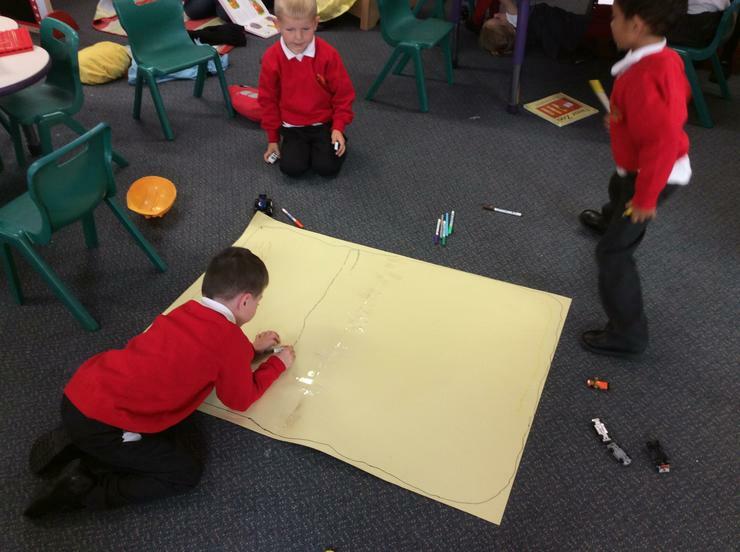 We wrote out shopping lists of the ingredients we would need. 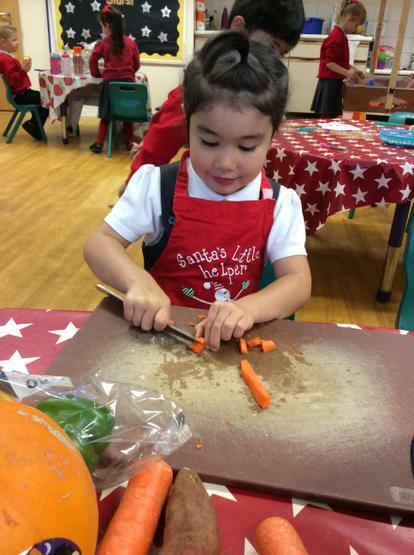 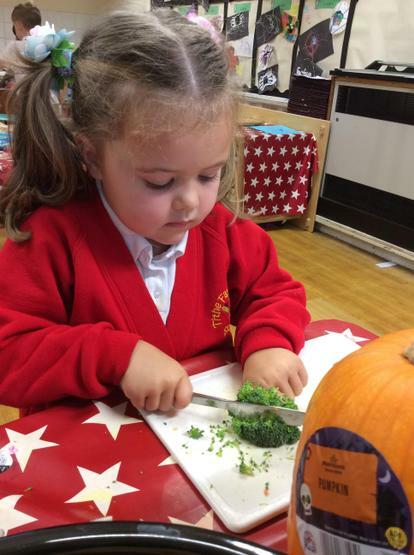 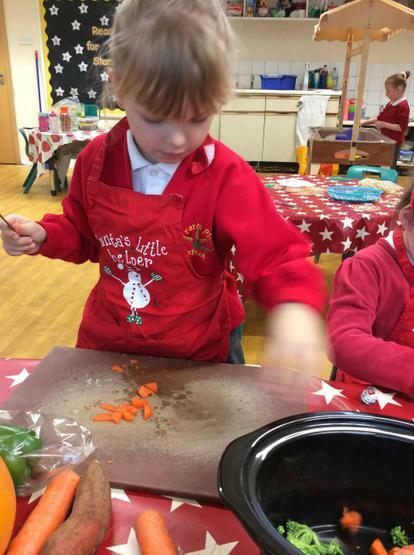 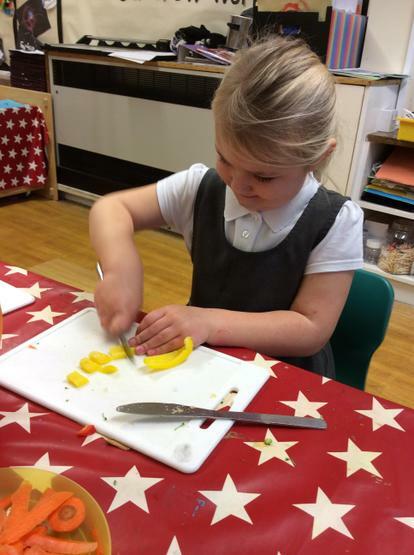 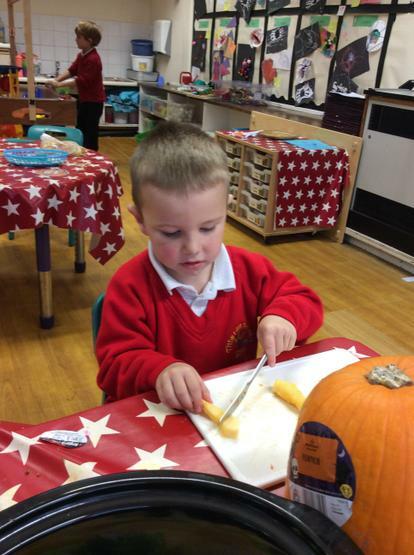 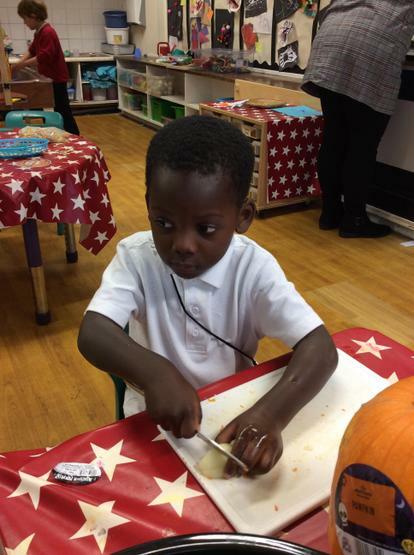 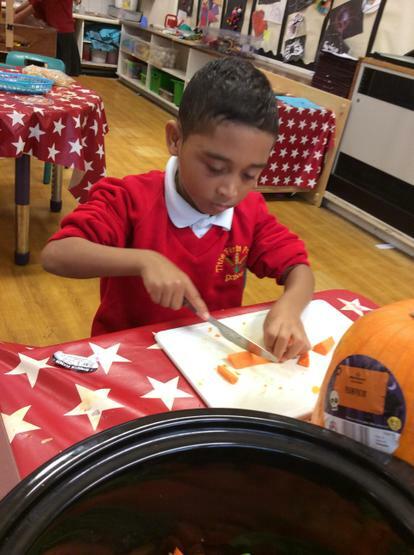 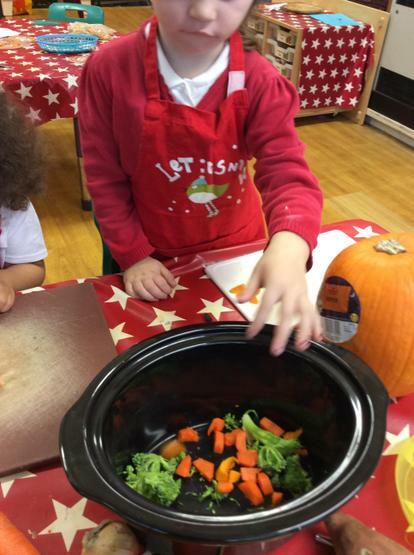 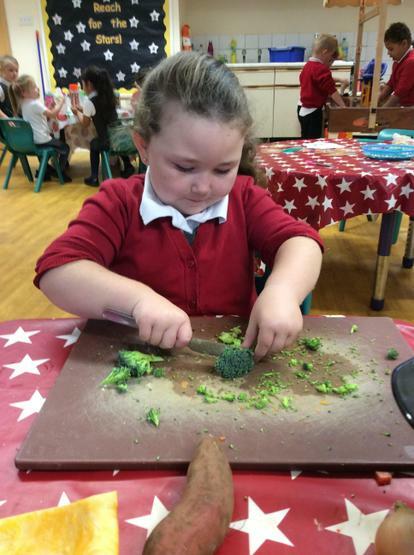 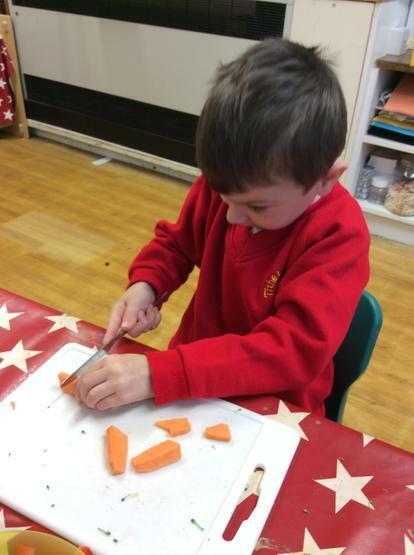 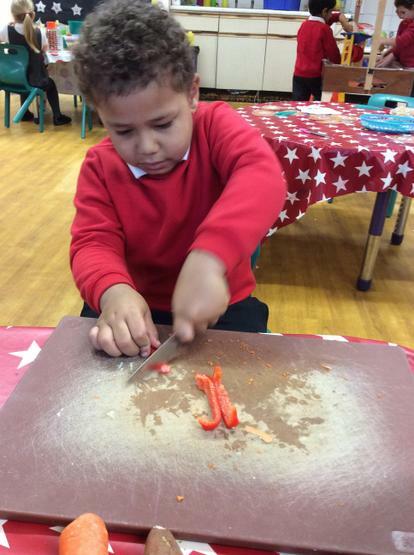 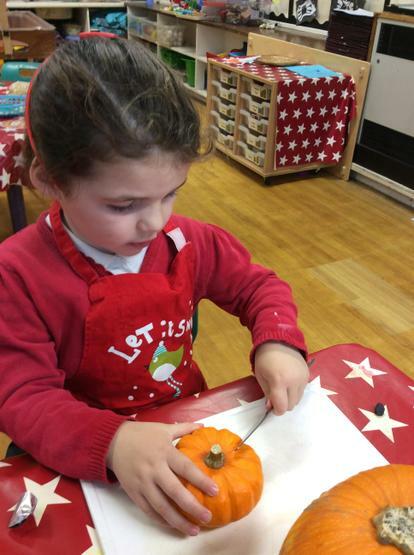 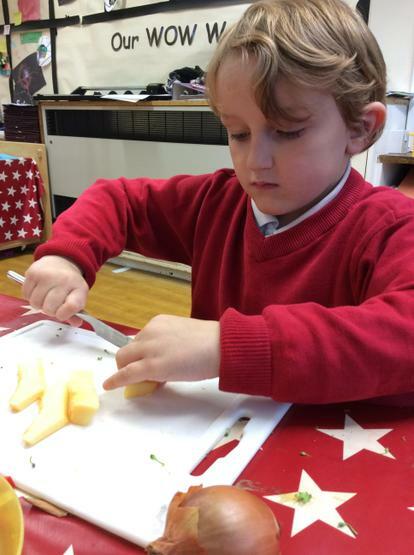 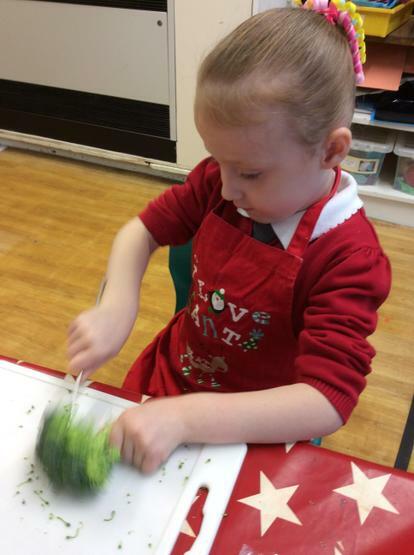 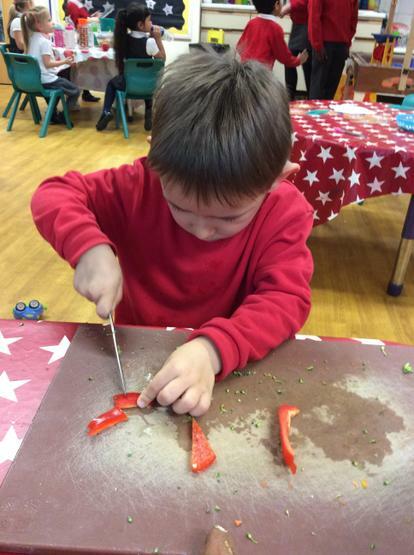 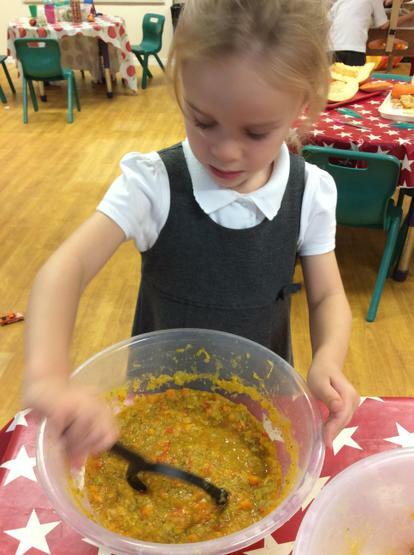 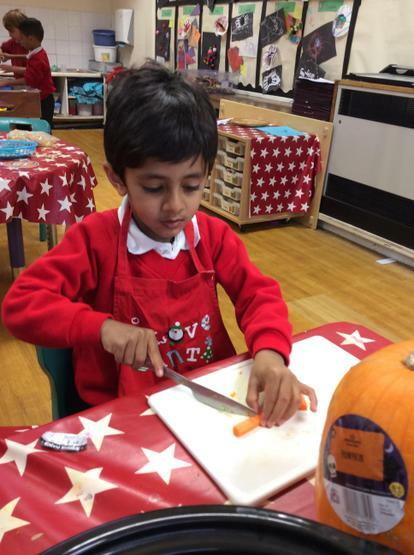 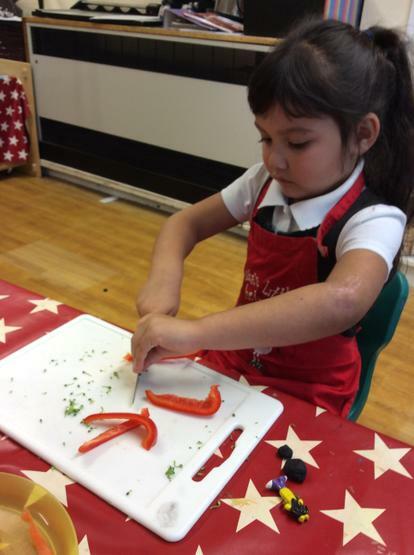 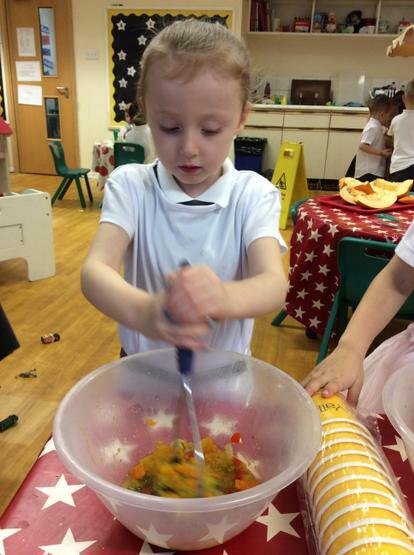 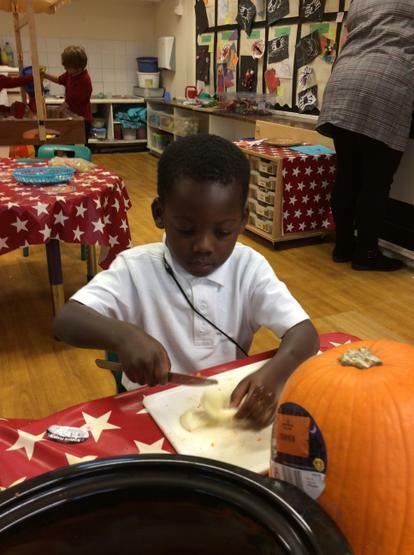 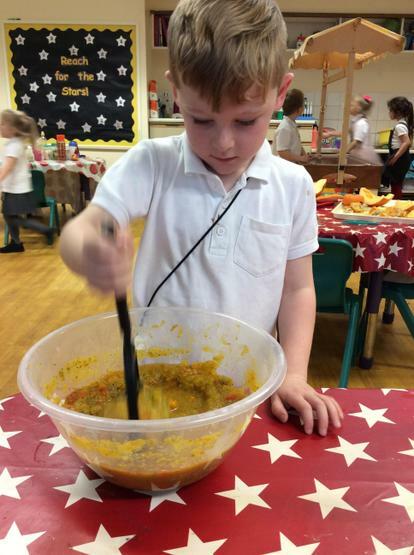 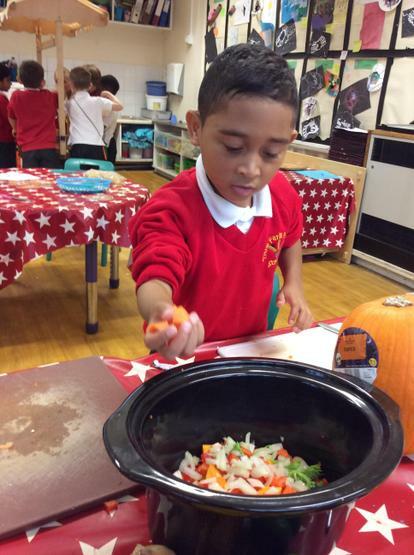 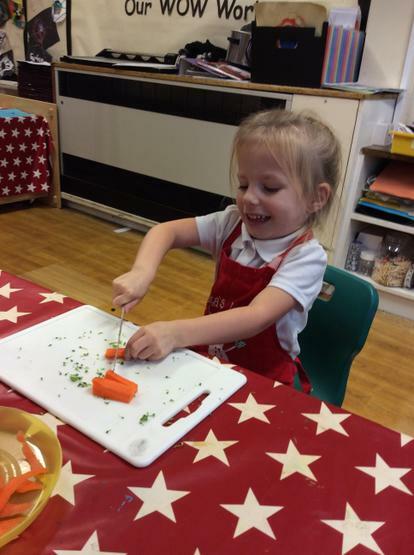 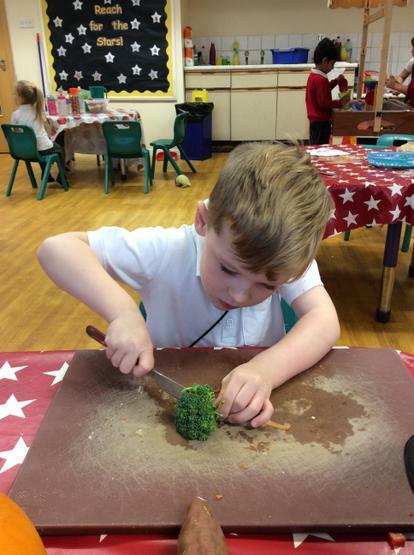 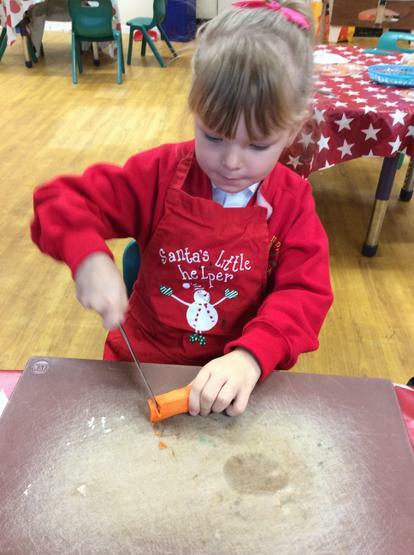 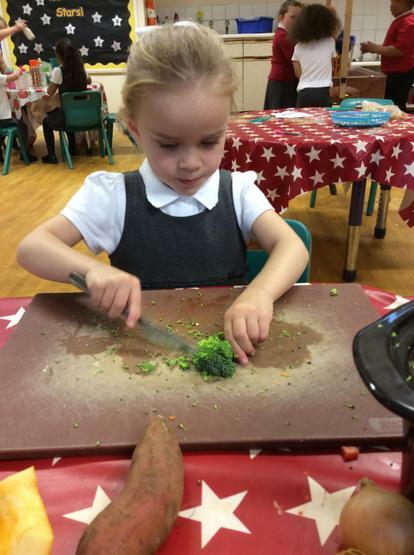 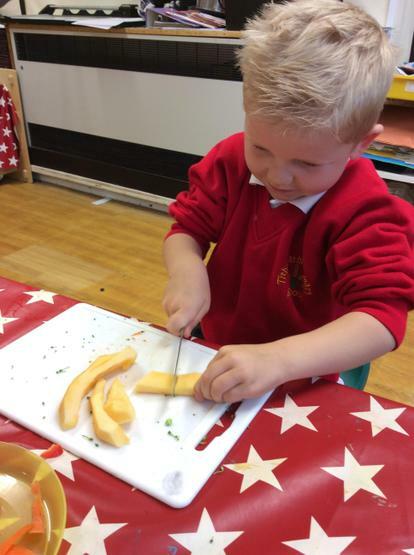 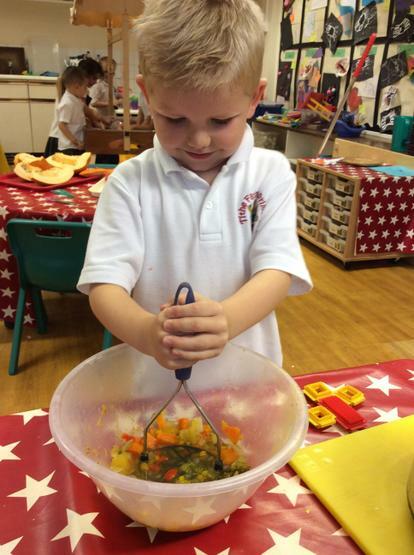 We then used knifes very carefully to cut up the vegetables to go into our soup. 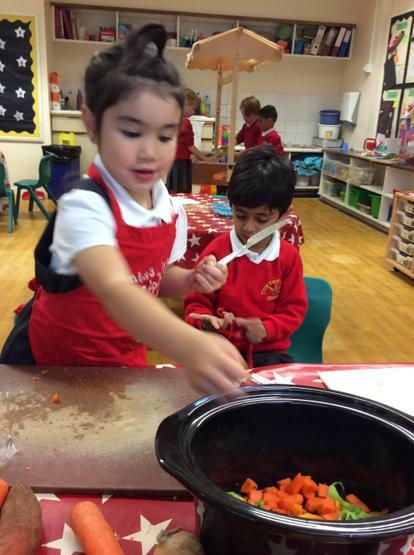 We added water and left it to cook in the slow cooker. 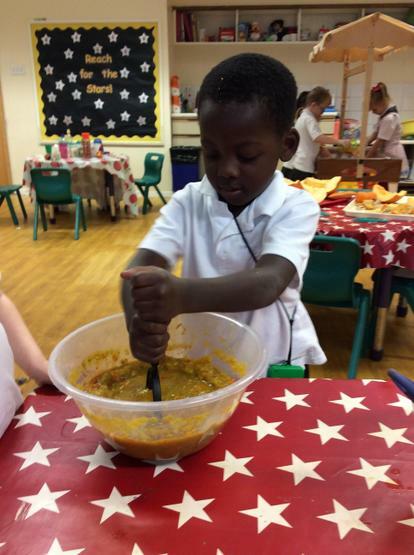 when it was ready we used potato mashes to mash the vegetables up before we ate it. 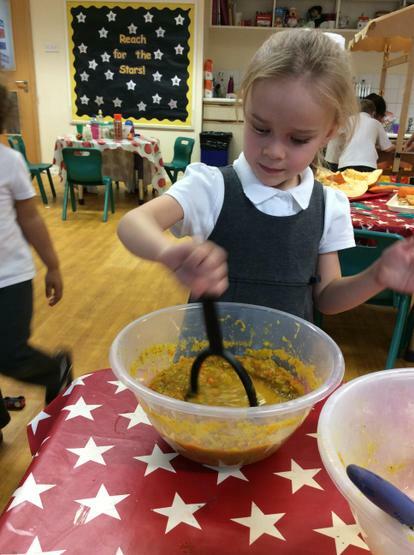 Some of us liked it, others were not so sure.